Jerusalem - The Giro d'Italia is to begin in Israel in 2018, the first time one of cycling's three major races has started outside Europe, the country's sport ministry said Thursday. A spokesman for Israeli sports minister Miri Regev confirmed the start, but could not immediately provide further details. A press conference has been scheduled for Monday. "We are proud to host in Israel any international competition and of course the Giro, which is an important competition with the world's best riders," the spokesperson told AFP. Hosting the race's start will mark a major sporting coup for Israel and provide it with an opportunity to promote its tourism industry in a year when it also celebrates 70 years since the country's creation. However, it also risks protests surrounding the event over its 50-year occupation of Palestinian territory. 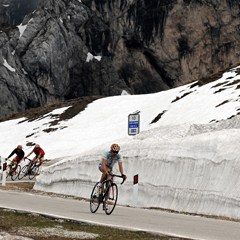 The Giro has started outside of Italy in the past, but never outside of Europe. Cycling's two other major races, the Tour de France and Vuelta a Espana, have also never begun outside of Europe. The Giro's other foreign starts have included Northern Ireland and the Netherlands, among others. According to Cycling Weekly, it will begin next year in Jerusalem with a possible time trial on May 5, followed by two stages in southern Israel and Tel Aviv, along the Mediterranean. Monday's press conference in Jerusalem is to be attended by cycling legends Alberto Contador and Ivan Basso, along with Italian and Israeli officials, a press release said. According to the publicity firm that issued the press release, the race is to end at the Vatican, with the theme co-existence and peace. Next year will mark the 101st edition of the three-week Italian race.